Work as a team. Solve problems. Celebrate mathematics. The Pi Day Mathematics Competition is an opportunity for secondary/ high school students in Qatar’s government and private schools to explore the fun side of mathematics. The ratio of a circle’s circumference to its diameter is an irrational number denoted by the Greek letter π and commonly approximated as 3.14. Every year, the day March 14 (written as 3/14 in the month/date format) is celebrated in several countries as Pi Day. The main objective of these celebrations is to highlight the importance of π and have some fun doing mathematics. Carnegie Mellon University in Qatar will host a Pi Day celebration by organizing a mathematics competition for high school students. The goal of this competition is to enhance awareness of and interest in mathematics in the high school communities in Qatar. Teams of four students compete in two rounds of mathematical problem solving. The preliminary round takes place on February 23, 2019 and the scores are tabulated. The top four teams advance to the final round, which is held in March. 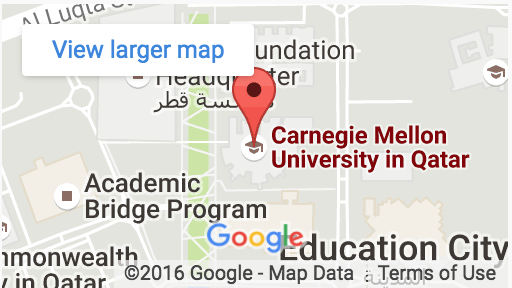 The venue for both events is the Carnegie Mellon University in Qatar campus in Education City. Any high school student in the State of Qatar is eligible to participate. See rules and regulations for more details. Please read the CMU-Q Pi Day mathematics competition rules and regulations before entering the competition. Certificates of Participation will be given to all participants in the preliminary round. The finalists will receive awards after the final round. The final round will be held at 10:00 a.m. on March 16, 2019 at Carnegie Mellon University Qatar. Please contact Professor Hasan Demirkoparan (hasand@qatar.cmu.edu) or Professor Zelealem Yilma (zyilma@qatar.cmu.edu).